Introducing Intel® Core™2 Quad processor for notebook and desktop PCs, designed to handle massive compute and visualization workloads enabled by powerful multi-core technology. Optimized for the longest possible battery life without compromise to performance, Intel Core 2 Quad processors for notebooks allow you to stay unwired longer while running the most compute-intensive applications. Providing all the bandwidth you need for next-generation highly-threaded applications, the latest four-core Intel Core 2 Quad processors are built on 45nm Intel® Core™ microarchitecture enabling faster, cooler, and quieter mobile and desktop PC and workstation experiences. Plus, with optional Intel® vPro™ technology, you have the ability to remotely isolate, diagnose, and repair infected desktop and mobile workstations wirelessly and outside of the firewall, even if the PC is off, or the OS is unresponsive. With four processing cores, up to 12MB of shared L2 cache,¹ and up to 1066 MHz Front Side Bus for notebooks, and up to 12MB of L2 cache² and up to 1333 MHz Front Side Bus for desktops, the Intel Core 2 Quad processor delivers amazing performance and power efficiency enabled by the all new hafnium-based circuitry of 45nm Intel Core microarchitecture. Whether you're encoding, rendering, editing, or streaming HD multimedia in the office or on the go, power your most demanding applications with notebooks and desktops based on the Intel Core 2 Quad processor. 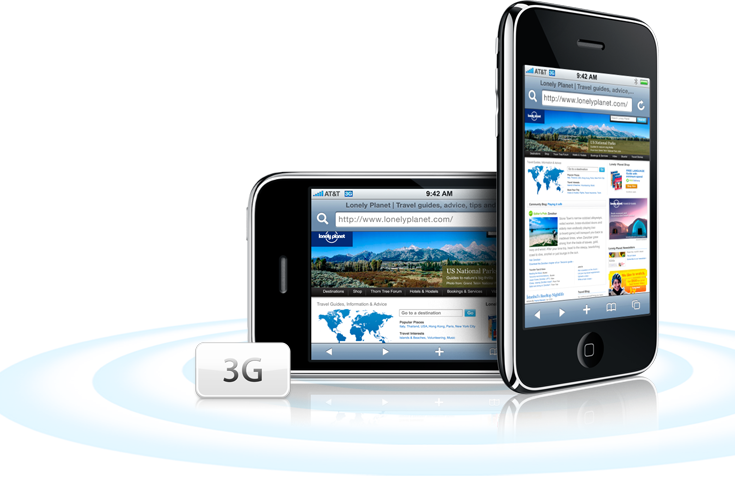 3G technology gives iPhone fast access to the Internet and email over cellular networks around the world. iPhone 3G also makes it possible to do more in more places: Surf the web, download email, get directions, and watch video — even while you're on a call. iPhone 3G uses a technology protocol called HSDPA (High-Speed Downlink Packet Access) to download data fast over UMTS (Universal Mobile Telecommunications System) networks. Email attachments and web pages load twice as fast on 3G networks as on 2G EDGE networks. 1 And since iPhone 3G seamlessly switches between EDGE, faster 3G, and even faster Wi-Fi, you always get the best speeds possible. iPhone 3G meets worldwide standards for cellular communications, so you can make calls and surf the web from practically anywhere on the planet. And if you're in an area without a 3G network, iPhone connects you via GSM for calls and EDGE for data. iPhone already gives you mobile multitasking. But 3G technology lets you multitask in more places — without connecting via Wi-Fi. Since 3G networks enable simultaneous data and voice, you can talk on the phone while surfing the web, checking email, or using Maps. All from your 3G cellular network. iPhone 3G delivers UMTS, HSDPA, GSM, Wi-Fi, EDGE, GPS, and Bluetooth 2.0 + EDR in one compact device — using only two antennas. Clever iPhone engineering integrates those antennas into a few unexpected places: the metal ring around the camera, the audio jack, the metal screen bezel, and the iPhone circuitry itself. And intelligent iPhone power management technology gives you up to 5 hours of talk time over 3G networks. 2 That's some of the best in the business. The Intel® X25-M and X18-M Mainstream SATA Solid-State Drive (SSD) brings a new level of performance and reliability to laptop and desktop PC storage. Why wait for a traditional hard disk drive to spin up? Unlike traditional hard disk drives, Intel solid-state drives have no moving parts, resulting in a quiet, cool, highly rugged storage solution that also offers faster system responsiveness. And for laptop PCs, the lower power needs of Intel SSDs translate to longer battery life and lighter notebooks. Higher performance with more durability means you can be truly mobile with confidence. Drawing from decades of memory engineering experience, Intel Mainstream SATA Solid-State Drives are designed to deliver outstanding performance, featuring the latest-generation native SATA interface with an advanced architecture employing 10 parallel NAND flash channels equipped with multi-level cell NAND flash memory. With powerful Native Command Queuing to enable up to 32 concurrent operations, Intel Mainstream SATA SSDs deliver higher input/output per second and throughput performance than other SSDs on the market today - and drastically outperform traditional hard disk drives. These drives also feature low write amplification and a unique wear-leveling design for higher reliability, meaning Intel drives not only perform better - they last longer. Intel® Mainstream Solid-State Drives are available in either 2.5" (Intel® X25-M Mainstream SATA Solid-State Drive) or 1.8" (Intel® X18-M Mainstream SATA Solid-State Drive) standard hard drive form factors. And all Intel Mainstream SSDs are tested and validated on the latest Intel-based mobile and desktop platforms for your peace of mind. At Microsoft, we're working hard to help protect your privacy, while delivering software that brings you the performance, power, and convenience you desire in your personal computing. This privacy statement explains the data collection and use practices of Microsoft Silverlight (“Microsoft Silverlight”). It does not apply to other online or offline Microsoft Web sites, products, or services. Microsoft Silverlight helps you to access and enjoy rich content on Web sites while using your Internet browser. This privacy statement describes how Microsoft Silverlight interacts with Microsoft in order to offer you Silverlight updates. Microsoft Silverlight does not request contact information such as your name, address, or phone number. However, there are occasions when Microsoft Silverlight transmits unique, computer-specific information across the Internet to Microsoft, as described below. Internet enabled features in software will send information about your computer ("standard computer information") to the websites you visit and web services you use. This information is generally not personally identifiable. Standard computer information typically includes information such as your IP address, operating system version, browser version, your hardware ID which indicates the device manufacturer, device name, and version, application version and your regional and language settings. In this case, the application version would be the version of Microsoft Silverlight installed on your device. Microsoft Silverlight contains an update notification feature that sends standard computer information to Microsoft. Information that is sent to Microsoft by this software will be used to provide you with Microsoft Silverlight features and services. This information may be used to improve Microsoft Silverlight and our other products and services, as well as for analysis purposes. Except as described in this statement, information you provide will not be transferred to third parties without your consent. We occasionally hire other companies to provide limited services on our behalf, such as packaging, sending, and delivering purchases and other mailings, answering customer questions about software or services, processing event registration, or performing statistical analysis of our services. We will only provide those companies the information they need to deliver the service, and they are prohibited from using that information for any other purpose. Information that is collected by or sent to Microsoft may be stored and processed in the United States or any other country/region in which Microsoft or its affiliates, subsidiaries, or agents maintain facilities, and by using Microsoft Silverlight, you consent to any such transfer of information outside of your country. Microsoft abides by the safe harbor framework as set forth by the U.S. Department of Commerce regarding the collection, use, and retention of data from the European Union. Microsoft may disclose personal information about you if required to do so by law or in the good faith belief that such action is necessary to: (a) conform to the edicts of the law or comply with legal process served on Microsoft; (b) protect and defend the rights of Microsoft (including enforcement of our agreements); or (c) act in urgent circumstances to protect the personal safety of Microsoft employees, users of Microsoft products or services, or members of the public. Dell ImageDirect™ for easy deployment and management of your mobile assets. Designed to help reduce IT costs while maintaining flexibility, Dell Essential laptops offer key features and functionality at a cost-effective price. Built small and light for the road warrior or executive, Dell Latitude Ultra-Portable laptops combine sleek looks, durability and advanced wireless connectivity. GIGABYTE UNITED INC., a leading manufacturer of motherboards and graphics cards is proud to announce their entire lineup of Intel P45 and P43 chipset based motherboards have just received a DDR2 memory performance upgrade. By upgrading to the latest BIOS, GIGABYTE P45 motherboards are able to support native 1333MHz DDR2 memory, while the GIGABYTE P43 motherboards are able to support 1200MHz DDR2 memory natively. In addition to providing industry-leading memory support, GIGABYTE has equipped their latest P45 and P43 motherboards with a comprehensive toolkit of features including Dynamic Energy Saver Advanced, GIGABYTE's Ultra TPM, Smart Backup - Plug & Play Hardware RAID, and a host of other features that not only maximize performance and energy efficiency, but also provide the highest levels of data security. With a Trusted Platform Module (TPM) chip built-in, GIGABYTE provides TPM hardware-based encryption and decryption with digital signature keys to ensure a maximum level of data protection with 2048 bit encryption. GIGABTE's Ultra TPM provides an added layer of security by allowing users to store their digital signature key on a USB thumb drive, so that when they step away from their system, they can take the key with them, locking up their data and preventing unauthorized access while they are away. When making the portable user key, GIGABYTE's Ultra TPM auto deletes the user key in the hard drive, ensuring the maximum level of data protection.